Wildfire Pleasure Oils -100ml. 4 in 1 oils for massage, bath, lubrication & arousal. Australian made by a Naturopath. SKU: N/A. Categories: For Them, Lotions & Potions, Massage, Lubricant, Essentials. Tags: bath, body, massage, oils, Pleasure, Wildfire. Change your love life forever with these Australian made indulgences that truly do enhance sensation and intensify touch. It’s love on a whole new level. Three (3) Amazing Pleasure Oils in the range. Each one unique – Original, Enhance Her & Black. The Original Formula that took bedrooms by storm is still changing love lives around the world. Ignite the passion as these exotic and powerful aphrodisiacs penetrate the skin. Take in the aroma the warmth and new sensations as this natural personal lubricant and massage oil helps you to discover each other all over again. Wildfire ORIGINAL is packed with erectile and libido herbs that enhance your performance and longevity in the bedroom. This beautiful couples formulation has something for everyone. The potent herbal aphrodisiacs help keep men in the game harder and longer while working on the female to increase her libido and sexual performance as they trans-dermally absorb into the bloodstream. Wildfire Enhance Her is specifically formulated to increase a womans pleasure and help her escape into a world of new sensations with exotic feminine fragrances and textures. Wildfire Enhance Her has been created to assist couples by increasing libido and fertility. It is perfect for menopausal women and women looking to regain their love life. 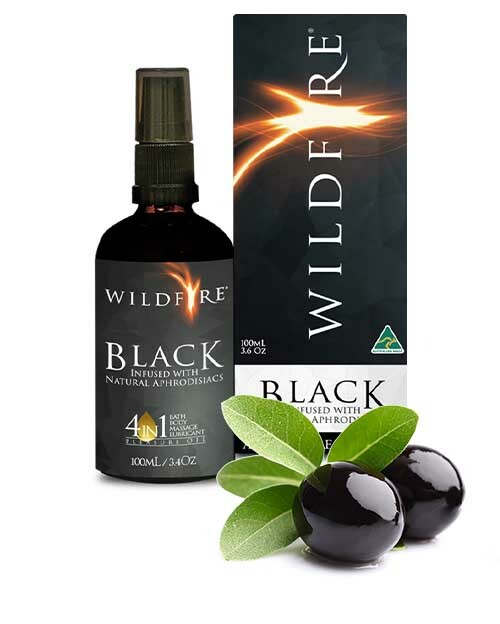 Wildfire’s extra virgin olive oil base provides nourishment and lubrication to the vaginal lining and helps slow the natural thinning process that occurs during menopause. Calandular has also been included for its natural soothing properties and is ideal for women who are sensitive and easily irritated. Olive Oil, Jojoba Oil, Chaste Tree Berry, Wild Yam, Vitamin E, Horny Goat Weed, Marigold, Black Cohosh, Tribulus, Ginkgo Biloba, Bergamot essential oil, Patchouli essential oil, Ylang Ylang essential oil, Sandalwood essential oil, Rose Geranium essential oil. Olive Oil, Jojoba Oil, Maca, Suma – Brazilian Ginseng, Muira Puama, Ginkgo Biloba, Horny Goat Weed, Damiana, Indian Ginseng, Vitamin E, Cnidium, Chinese Wolfberry, Rhodiola Rosea, American Ginseng, Ylang Ylang essential oil, Bergamot essential oil, Patchouli essential oil, Rosewood essential oil, Sweet Orange essential oil.